Researchers have concluded that Earth’s ice loss is picking up speed, with the Antarctic and Greenland ice sheets losing three times as much mass each year as they were during the 1990s. Data obtained via satellite and aircraft observations indicate that the Greenland ice sheets are experiencing the most rapid annual deterioration. “Both ice sheets appear to be losing more ice now than 20 years ago, but the pace of ice loss from Greenland is extraordinary, with nearly a five-fold increase since the mid-1990s,” Erik Ivins, a scientist at NASA’s Jet Propulsion Laboratory, said. A paper published Thursday in Science indicates that about two-thirds of an annual 0.95 millimeter increase in sea levels worldwide is accounted for by Greenland’s ice loss. Overall, melting of the Antarctic and Greenland ice sheets have caused sea levels to rise by 11.1 millimeters, or about twenty percent of Earth’s total sea level increase, since 1992. The new study clarifies the extent to which Antarctic ice loss is occurring. The 2007 report of the Intergovernmental Panel on Climate Change suggested that no conclusion regarding Antarctic ice loss was possible. Forty-seven researchers at 26 different laboratories worked together on the Science paper. After years of independent reports based on uncoordinated systems for interpreting ice loss data, the scientists developed a common measurement system. NASA’s probe to Mercury has found evidence of water, albeit in solid form, on the planet in the solar system that is closest to the sun. Three independent lines of evidence support this conclusion: the first measurements of excess hydrogen at Mercury’s north pole with MESSENGER’s Neutron Spectrometer, the first measurements of the reflectance of Mercury’s polar deposits at near-infrared wavelengths with the Mercury Laser Altimeter (MLA), and the first detailed models of the surface and near-surface temperatures of Mercury’s north polar regions that utilize the actual topography of Mercury’s surface measured by the MLA. The discovery may seem counter-intuitive, given Mercury’s high daytime surface temperatures. Though the thermometer can reach 800 degrees Fahrenheit on the side of the planet facing the sun, the planet’s north pole is permanently shielded from the nearby star. Ice can be visually observed in the region between about the same latitude on Mercury (85 degrees North) as the Tropic of Cancer on Earth (90 degrees North) and the pole. 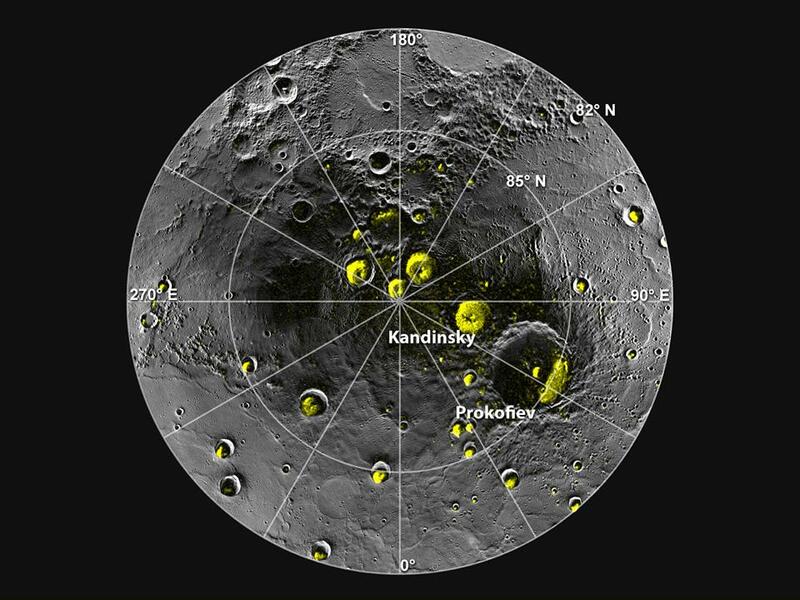 The probe has not confirmed evidence of ice at Mercury’s south pole. MESSENGER, which launched in Aug. 2004, will experience orbital decay by 2015 as its fuel supply runs out. During its close approach to Mercury’s surface it may be possible to make more detailed observations of frozen water on our solar system’s inner-most planet. Mosaic image of ice within craters near Mercury’s north pole courtesy NASA/Johns Hopkins University Applied Physics Laboratory/Carnegie Institution of Washington/National Astronomy and Ionosphere Center, Arecibo Observatory. Scientists are trying to figure out what killed the great astronomer Tycho Brahe, who died in 1601. Great Britain’s Guardian newspaper has an interesting story about what’s been learned so far. Hint: If Tycho was murdered, his killer didn’t use mercury to do the deed.